Prepare the chive vinaigrette: Carefully chop the chives as finely as possible. Add these to the oil and balance the vinaigrette with the lemon juice. Season with fine salt. Pick through your crab to remove any pieces of shell. Season with salt and pepper. Add the picked crab and chopped parsley then mix through some of the mayonnaise and put back in the fridge. Prepare your fennel: Remove the tough core and slice very finely on a mandolin. Wilt the fennel by seasoning with salt. Place in a colander to allow the water to drain off. Dress the fennel with olive oil, lemon juice and some flat parsley. 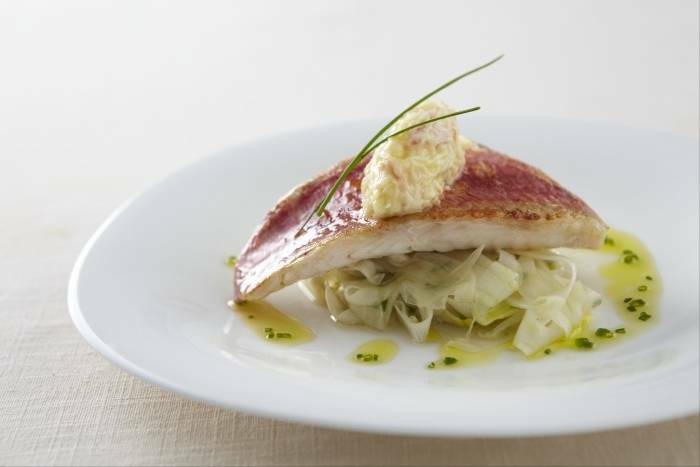 To assemble the dish: place the mullet on top of a small mound of fennel , drizzle round the chive vinaigrette and place a quenelle of crab mayonnaise on top of the fish.